Courtney Melba Barnett (born 3 November 1987) is an Australian singer, songwriter, and musician. Known for her witty, rambling lyrics and deadpan singing style, she attracted attention with the release of her debut EP, I've Got a Friend Called Emily Ferris. International interest from the British and American music press came with the release of The Double EP: A Sea of Split Peas in October 2013. In 2017, she released Lotta Sea Lice, a collaborative album with Kurt Vile. Barnett's second album, Tell Me How You Really Feel, was released on 18 May 2018. Courtney Melba Barnett was born in Sydney on 3 November 1987. She grew up in Sydney's Northern Beaches. When she was 16, her family moved to Hobart. She attended St Michael's Collegiate School and Tasmanian School of Art. Having grown up on American bands, she discovered Australian singer-songwriters Darren Hanlon and Paul Kelly which inspired her to start writing songs. Before finding fame, she worked as a pizza delivery driver. From 2010 to 2011, Barnett played second guitar in Melbourne garage grunge band Rapid Transit. They released one self-titled album on cassette, which is now a rare collector's item. Between 2011 and 2013, she was a member of Australian psych-country band Immigrant Union, a musical project founded by Brent DeBoer (of The Dandy Warhols) and Bob Harrow. Along with sharing vocal duties, Barnett predominantly played slide guitar and is on the band's second studio album, Anyway. DeBoer also played drums on Barnett's first EP, I've Got a Friend called Emily Ferris. It appeared in 2012 on Barnett's own label, Milk! Records. In 2013, Barnett played lead guitar on Jen Cloher's third studio album, In Blood Memory, which was released on Milk! Records. Following the release of her first EP, Barnett signed to Marathon Artists (via its imprint House Anxiety). In August 2013, Marathon Artists released The Double EP: A Sea of Split Peas, a combined package of Barnett's first EP and her second EP, How to Carve a Carrot Into a Rose. The Double EP brought Barnett international critical acclaim, with "Avant Gardener", the lead single, named Track of the Day by Q Magazine and Best New Track by Pitchfork in 2013. It was named the album of the week by Stereogum The track "History Eraser" was nominated for the APRA Song of the Year. How to Carve a Carrot into a Rose was released on a limited run by Milk! Records as a standalone EP in October 2013. Marathon Artists and House Anxiety partnered with Mom + Pop Music for the U.S. release of The Double EP in 2014. Milk! Records released a compilation EP, A Pair of Pears (with Shadows), on 10" white vinyl in September 2014, following a crowd-sourcing campaign in July that year. The EP included a Barnett track, "Pickles from the Jar", the song was voted in at number 51 in Triple J's Hottest 100 for 2014. On 30 January 2015, Barnett released details on her upcoming full-length album, recorded in April 2014 with Burke Reid, along with two singles, "Pedestrian at Best" and "Depreston" and accompanying music videos. The music video for "Pedestrian at Best" features Cloher and Fraser A Gorman. Her debut album, Sometimes I Sit and Think, and Sometimes I Just Sit, was released worldwide via Milk! Records (Australia), Marathon Artists / House Anxiety (UK & Rest of World), and Mom + Pop Music (US) on 23 March 2015, and was accompanied by tours in the UK and Europe, America, and Australasia. Sometimes I Sit and Think was met with critical acclaim, The Guardian, The Times, Pitchfork and the Chicago Tribune. In August 2015, Barnett's UK label, Marathon Artists, in partnership with Mom + Pop Music and Milk! Records, launched a global, guerilla campaign for the release of her single Nobody Really Cares If You Don't Go to the Party. Billboards and posters bearing the song's title went up in London, New York, LA, Melbourne and Sydney. The campaign garnered a lot of interest online and across social media and culminated in a surprise busking gig in Camden, London. In concert, Dan Luscombe (of The Drones) has often played lead guitar and keyboards, having featured on both, How to Carve a Carrot Into a Rose and Sometimes I Sit and Think, and Sometimes I Just Sit, the latter of which he also co-produced. When Luscombe was not available, the band performed as a trio, with Barnett handling all guitar duties. Luscombe did not play on Barnett's 2015 tours, however, and she now refers to the band as the "CB3" on her Facebook page. The CB3 moniker also features prominently on drummer Dave Mudie's bass drum. Barnett was nominated in eight categories at the ARIA Music Awards of 2015, and won four trophies: Breakthrough Artist, Best Female Artist, Best Independent Release and Best Cover Art for Sometimes I Sit and Think, and Sometimes I Just Sit. At the end of 2015, Barnett was nominated for a Grammy Award in the Best New Artist category. She was later nominated for Best International Female in 2016 for the Brit awards. On 21 May 2016, she was the musical guest on the season finale of Saturday Night Live's 41st season, hosted by Fred Armisen. In January 2016, Barnett appeared on the cover of Australian music magazine, Happy Mag. And on 27 May 2016, she was the musical guest on The Tonight Show Starring Jimmy Fallon. In 2017, Barnett and Kurt Vile recorded the collaborative album Lotta Sea Lice, released via Matador Records, Marathon Artists and Milk! Records on October 13. Some of the album collaborators include Stella Mozgawa, Mick Harvey and the Dirty Three's Mick Tuner and Jim White. The lead single "Over Everything" was released on August 30, 2017 accompanied by the music video directed by Danny Cohen. "Over Everything" initially sparked the pair's collaboration, after Philadelphia-based Vile wrote the song with the Melbourne-based Barnett's voice in mind. The second single "Continental Breakfast" was released on 26 September 2017. In June 2017 Vile and Barnett announced a North American tour. The duo was backed by the Sea Lice, a band featuring Janet Weiss (Sleater-Kinney, Wild Flag), Rob Laakso (The Violators, The Swirlies, Mice Parade), Stella Mozgawa (Warpaint), and Katie Harkin (Sky Larkin, touring member of Sleater-Kinney and Wild Beasts). On 12 February 2018, Barnett teased a new album on her social media accounts, featuring Barnett trying out various musical instruments with the clip ending with the tagline Tell Me How You Really Feel. Barnett released the singles "Nameless, Faceless", "Need A Little Time", "City Looks Pretty", and "Sunday Roast" from her sophomore solo album, which was launched at a private function at Sydney's Lansdowne Hotel in April 2018 and emceed by ex-Go-Between Lindy Morrison. The album was eventually released on 18 May 2018 and titled Tell Me How You Really Feel. "City Looks Pretty" was featured on the soundtrack of the video game FIFA 19. In 2019, she was added to the bill of Woodstock 50. Barnett plays left handed, using mostly left-hand constructed guitars, with standard tuning and string order for left-handed players (low strings at top, high strings at the bottom). She occasionally plays right-handed guitars flipped upside down, but does not prefer it. She learned to play on acoustic guitars, and disliking the sound of a pick, developed her own method of fingerstyle guitar which she later translated to use on the electric guitar. She is capable of using a pick (and claims she could probably play better with one), but prefers to play with just her fingers, strumming with both her thumb and index finger on rhythm parts, and using her index finger as one would use a pick for lead parts. She prefers to play in standard tuning, even when playing alongside other artists using alternate tunings. Among her guitars she uses for performance and recording are a Harmony H59, and a number of Fenders, including Jaguars, Stratocasters, and Telecasters, which she strings with Ernie Ball Power Slinky strings in the 0.011−0.048 gauge. She plays through Fender Hot Rod Deville and Fender Deluxe amplifiers, with a number of effects pedals, including a Fulltone OCD overdrive pedal, a "cheap delay pedal", and a chorus pedal. Barnett is openly gay and was in a relationship with fellow musician Jen Cloher from 2012 to 2018. The song "Numbers" was co-written by Barnett and Cloher about their relationship. Barnett's song "Pickles from the Jar" also details their relationship, and Cloher is mentioned by name in the first line of "Dead Fox". Barnett admits to Cloher being a "huge constant influence" on her music. Barnett also played guitar in Cloher's band from 2012 to 2018. Barnett has won 6 ARIA Music Awards from 20 nominations. ^ Greene, Jayson (1 October 2013). "Rising: Courtney Barnett". Pitchfork. Retrieved 26 October 2013. ^ Newstead, Al (4 October 2013). "It's An Aussie Invasion, Local Artists Making Waves Overseas". Tonedeaf. Retrieved 26 October 2013. ^ "Courtney Barnett & Tame Impala Nominated In 2016 Brit Awards". TheMusic.com.au. Retrieved 15 October 2017. ^ "Awards". Grammy.com. 30 April 2017. Retrieved 15 October 2017. ^ "Kurt Vile and Courtney Barnett Reveal Details About Their New Joint Album". pastemagazine.com. Retrieved 2017-09-23. ^ a b c d "See Kurt Vile, Courtney Barnett's Deadpan 'Over Everything' Video". Rolling Stone. Retrieved 2017-09-23. ^ "Courtney Barnett Announces New Album and Tour, Shares New Song: Listen | Pitchfork". pitchfork.com. Retrieved 2018-02-15. ^ a b "Courtney Barnett on What Makes Her Different". That Music Magazine. Retrieved 21 September 2015. 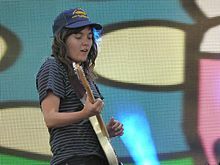 ^ "SXSW: Indie 'it' girl Courtney Barnett is bracing for the backlash". Thestar.com. 18 March 2015. Retrieved 26 March 2015. ^ Young, Kane (28 April 2014). "Ex Hobart rocker Courtney Barnett wows US crowds on The Tonight Show". The Mercury. Retrieved 29 April 2014. ^ "Rising: Courtney Barnett | Features". Pitchfork.com. 1 October 2013. Retrieved 3 July 2015. ^ Boulton, Martin (11 May 2012). "City just fine and Dandy". The Age. Retrieved 1 June 2014. ^ Henriques-Gomes, Luke (22 October 2013). "Courtney Barnett Talks Shadow Electric, Her Double EP, & Accidentally Making It Overseas". Tonedeaf. Retrieved 26 October 2013. ^ "Courntey Barnett 'Avant Gardener' named Track of the Day". Q Magazine. Retrieved 21 January 2015. ^ "The Top 100 Tracks of 2013". Pitchfork. Retrieved 18 March 2015. ^ Breihan, Tom (15 October 2013). "Album of the Week: Courtney Barnett The Double EP: A Sea Of Split Peas". Stereogum. Retrieved 26 October 2013. ^ "Avant Gardener". Remote Control Records. 1 May 2014. Archived from the original on 5 April 2015. Retrieved 18 March 2015. ^ Goodman, Lizzy (23 March 2015). "Meet Courtney Barnett, Music's Lena Dunham: 'I Like the Extreme Form of Not Bottling Things Up'". Billboard. Retrieved 25 March 2015. ^ "Triple J: Hottest 100 2014". Australian Broadcasting Corporation. Retrieved 18 March 2015. ^ Bakare, Lanre (19 March 2015). "Courtney Barnett: Sometimes I Sit and Think, and Sometimes I Just Sit review – acerbic and staunchly down-to-earth". The Guardian. Retrieved 19 January 2016. ^ Wilson, Martin. "Courtney Barnett Shares Video & Album Details". Overblown. Retrieved 3 March 2015. ^ Terry, Josh (4 February 2015). "Courtney Barnett announces US tour dates". Consequenceofsound.net. Retrieved 22 May 2015. ^ Newsdesk, NME (3 February 2015). "Courtney Barnett announces UK tour dates". Retrieved 19 January 2016. ^ 50 Best Albums of 2015 | Rolling Stone. Rolling Stone. 1 December 2015. Retrieved 9 January 2016. ^ Best albums of 2015: No 7 – Sometimes I Sit and Think, and Sometimes I Just Sit by Courtney Barnett | The Guardian Culture. The Guardian. 10 December 2015. Retrieved 9 January 2016. ^ 100 best records of the year | The Times. The Times. 6 December 2015. Retrieved 21 Jan 2016. ^ The Best 50 Albums of 2015 | Pitchfork. Pitchfork. 16 December 2015. Retrieved 9 January 2016. ^ Best albums of 2015: Kendrick Lamar, Courtney Barnett and more | Chicago Tribune. Chicago Tribune. 3 December 2015. Retrieved 9 January 2016. ^ Moskovitch, Greg (19 January 2016). "Courtney Barnett Guerilla Marketing Campaign Goes Global, Confuses Everyone". Tonedeaf. Retrieved 12 August 2015. ^ Quine, Oscar (19 January 2016). "Courtney Barnett interview: The Melbourne singer-songwriter is the voice-of-a-generation". The Independent. Retrieved 28 August 2015. ^ Hearon, Lisa (19 January 2016). "Londoners didn't know they were at a Courtney Barnett gig". Mashable. Retrieved 17 August 2015. Search Results 'Courtney Barnett': "Winners by Year: Search Results for 'Courtney Barnett'". Australian Recording Industry Association (ARIA). Retrieved 12 December 2015. 2015 winners: "And the ARIA Awards Goes to..." Australian Recording Industry Association (ARIA). 27 November 2015. Retrieved 12 December 2015. 2016 winners and nominees: "Winners by Year 2016". Australian Recording Industry Association (ARIA). Retrieved 11 October 2017. 2018 winners and nominees: Australian Recording Industry Association (ARIA) (28 November 2018). "And the ARIA Award Goes To..." Australian Recording Industry Association (ARIA). Retrieved 29 November 2018. ^ "Grammys 2016 Preview: What You Need to Know About Best New Artist Nominees From Courtney Barnett to James Bay". Billboard. 5 January 2016. Retrieved 21 January 2016. ^ "Brit Awards 2016 Nominations and Winners". The Telegraph. 14 January 2016. Retrieved 1 January 2017. ^ Navaroli, Joel. "SNL Archives | Episodes | 05.21.2016". SNL Archives. Retrieved 28 May 2016. ^ "Happy Mag issue # 1". Store.hhhhappy.com. Retrieved 15 October 2017. ^ "Kurt Vile and Courtney Barnett Announce Tour, New Collaborative Album | Pitchfork". pitchfork.com. Retrieved 2017-09-23. ^ "Kurt Vile and Courtney Barnett Reveal New Album Title | Pitchfork". pitchfork.com. Retrieved 2017-09-23. ^ "Courtney Barnett Teases New Music: Watch | Pitchfork". pitchfork.com. Retrieved 2018-02-13. ^ Roberts, Christopher. "Woodstock 50 Lineup Announced – Courtney Barnett, boygenius, The Black Keys, and More". undertheradarmag.com. Retrieved 2019-03-24. ^ a b Gluckin, Tzvi. "Courtney Barnett: The New Sensation (interview)". Premier Guitar. Retrieved 4 April 2018. ^ "Courtney Barnett". Equipboard. Retrieved 4 April 2018. ^ "Listen | Music, Death and Memory – Jen Cloher and Jo Syme in Conversation | Control". Retrieved 2019-02-28. ^ "JEN CLOHER Happy wife... | X-Press". www.xpressmag.com.au. Retrieved 2018-03-15. ^ Kathryn Bromwich (2017-10-14). "Courtney Barnett: 'It's easy to feel hopeless and lost in this weird world'". The Observer. Retrieved 2017-10-14.